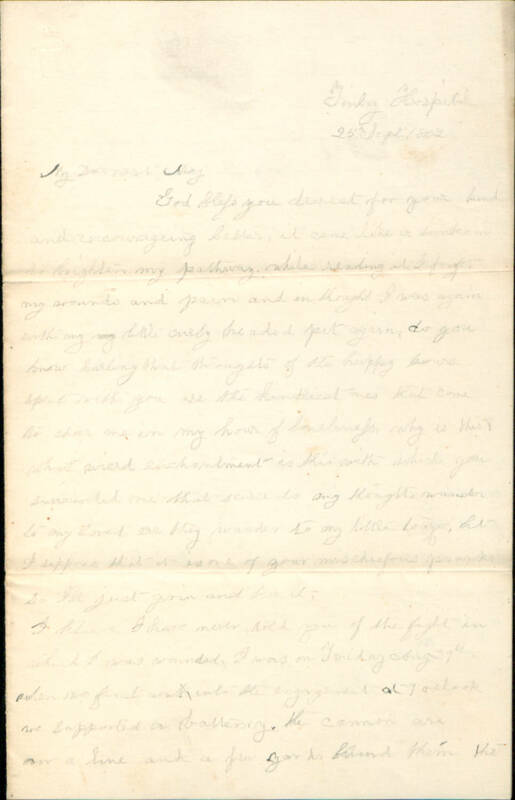 Item description: Letter, dated 25 September 1862, from J. Smith DuShane (Pat), a sergeant in Company K of the 100th Pennsylvania Infantry Regiment, to his ‘beloved’; The letter describes how he was wounded at 2nd Bull Run on 29 Aug. 1862. Item citation: From the J. Smith DuShane Letters #5198-z, Southern Historical Collection, Wilson Library, University of North Carolina at Chapel Hill. God bless you dearest for your kind and encouraging letter, it came like a sunbeam to brighten my pathway. while reading it I forgot my wounds and pain and in thought I was again with my my little curly headed pet again. do you know darling that thoughts of the happy hours spent with you are the kindliest ones that come to cheer me in my hour of loneliness, why is this? what wierd enchantment is this with-which you surrounded me that scarce do my thoughts wander to my loved ere they wander to my little teaze. but I suppose that it is one of your mischiefous pranks so I’ll just grin and bear it. 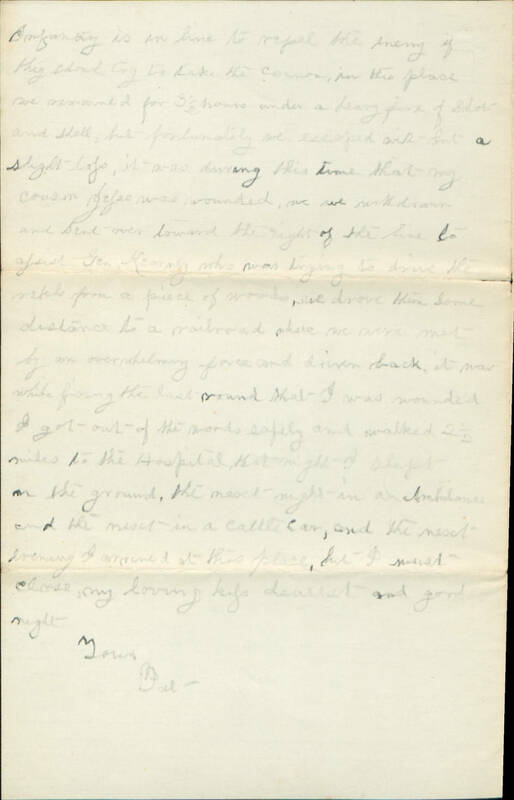 This entry was posted in Southern Historical Collection and tagged Finley Hospital, hospitals, J. Smith DuShane, love letters, Pennsylvania, Second Battle of Bull Run, Second Battle of Manassas, Virginia. Bookmark the permalink.